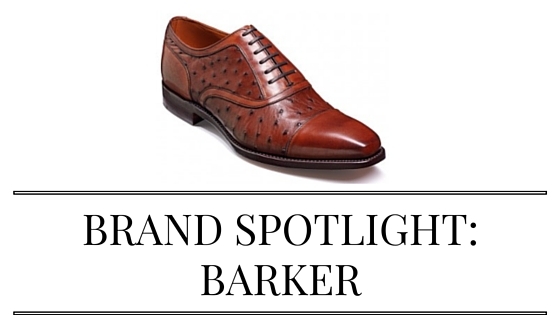 It’s the next in our series of ‘Brand Spotlights’ on our fantastic range of high quality shoe brands, and this time it’s Barker Shoes, one of England’s oldest and best known shoe brands, handmade in Northamptonshire. - The new Barker purpose-built factory was custom built to achieve perfection when it comes to crafting beautiful leather shoes - for example, good natural light is a prime requirement for leather grading, colour matching and consistently good stitching, so the environment was designed to provide this. Quality standards are key, and only the most carefully selected leathers are used. Barker continue to use a lot of traditional shoemaking methods, including slow natural drying, polishing and the uppers are shaped on the last by hand. These techniques steeped in heritage and tradition combine to create the perfect leather shoe. It should come as no surprise that an esteemed brand like Barker Shoes should have several envious collections of shoes and boots to swoon over. Delve into the anniversary collection, or revel in the handcrafted range. The country collection offers the same attention to detail and style, with the addition of a more robust sole, and the professional collection is just what your new suit for the office needs. Not just for the gents however, Barker also offer an extensive range of ladies shoes and boots as well, with new collections released every season. At Robinsons’s Shoes, we stock a full range of men's Barker shoes and boots including Barker brogues, as well as the ladies range of shoes and boots. Spoilt for choice? If we had to pick our personal favourite top 3 Barker shoes, we’d have to go with the Barker Puccini oxford crafted using the finest ostrich and calf leathers, the McClean Brogue in cedar calf and blue suede and the inimitable classic derby Barker Marlowe featuring an exclusive laser cut design to the toe. Don’t take our word for it though – see them for yourself in our lovely Carrickfergus store, and we’ll be more than happy to help you find your perfect pair. If it doesn’t suit you to call in, you can browse the full range on our website and order online – with free delivery worldwide on orders over £150.